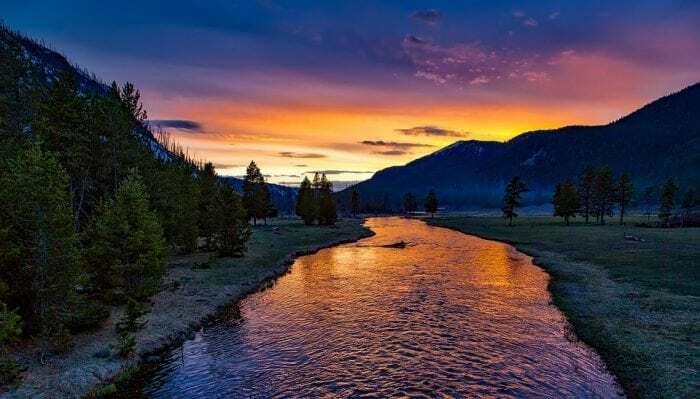 Yellowstone National Park is one of the first national parks in the United States. It is home to numerous ecosystems, species of animals, and natural sites to visit, like geysers and hot springs. It is a widely visited and nationally popular tourist site to celebrate the beauty of the natural world. It was the home of Native Americans for over 11,000 years before colonization. The park was established by Congress and President Grant in 1872 and is the home to many endangered species of plants and animals. It is also the home of some of North America’s largest animals, like bears and bisons. Among its many accolades, Yellowstone is also home to the largest supervolcano in North America that remains active today. At the recent IAVCEI Scientific Assembly, scientists shared new and important updates on the volcanic situation at Yellowstone that could change how we prepare for such an explosion. The volcanic explosivity index, ranging from 1 (least explosive) to 8 (most explosive), is used to measure how explosive a volcanic eruption is or can be. Supervolcanoes are volcanoes whose VEI is measured to be 8. This means that they are very powerful and can cover an area of 240 cubic miles. Supervolcanoes are the result of large amounts of pressure that has been built up in large and growing magma pools beneath the crust. The magma travels from the mantle to the crust and is prevented from releasing, resulting in the pressure. These eruptions can be as quick as what we imagine a volcanic eruption looks like or they can be extended over a large period of time, including over millions of years. The destruction these events cause are extensive and costly for many different areas. Since the eruptions can reach hundreds of square miles, they endanger a lot of things in the immediate area and further out. Large amounts of volcanic debris are released into the atmosphere and blanket the sky. They result in diminished sunlight during the day. This can cause large amounts of vegetation to die out and lead to the death of animals that depends on those plants and so on. It would also result in things becoming cooler because sunlight is being reflected away from the blanketed area. This could trigger climate changes that extend for a large period of time, like ice ages. These changes would affect the natural environments and the humans that live around those areas. It might trigger widespread food shortages, homelessness as people are forced to evacuate, or even chaos in places not accustomed to colder temperatures. The most recent supervolcano eruption was the Oruanui Eruption, which is in New Zealand, that occurred 26,500 years ago. It was generally believed to be about a 7-8 on the VEI scale. The eruption was felt by the ancient people during that time as far as 620 miles away in the Chatham Islands, which saw ashfall. One of the largest eruptions in geological history occurred about 132 million years ago (MYA) in South America. That supervolcano had a volume of over 2,000 cu miles. Now, it is speculated the eruption could have been a chain reaction as part of a group instead of a single supervolcano. The Yellowstone Caldera, or supervolcano, is about 34 by 45 miles and its origin is contested. There is no single consensus as to how the hotspot that forms the volcano came about, but it does not change the present danger it poses. The supervolcano is in its current because of its previous eruptions. Those eruptions were the Huckleberry Ridge eruption 2.1 MYA, the Mesa Falls eruption 1.3 MYA, and the Lava Creek eruption 630,000 years ago. The caldera is also subjected to earthquakes, which can destabilize the region. If Yellowstone were to erupt, it would cause tremendous damage across the United States. The explosion would create lava flow around the park, but not extend further out. Most of the explosion would eject into the atmosphere, spreading ash and debris. 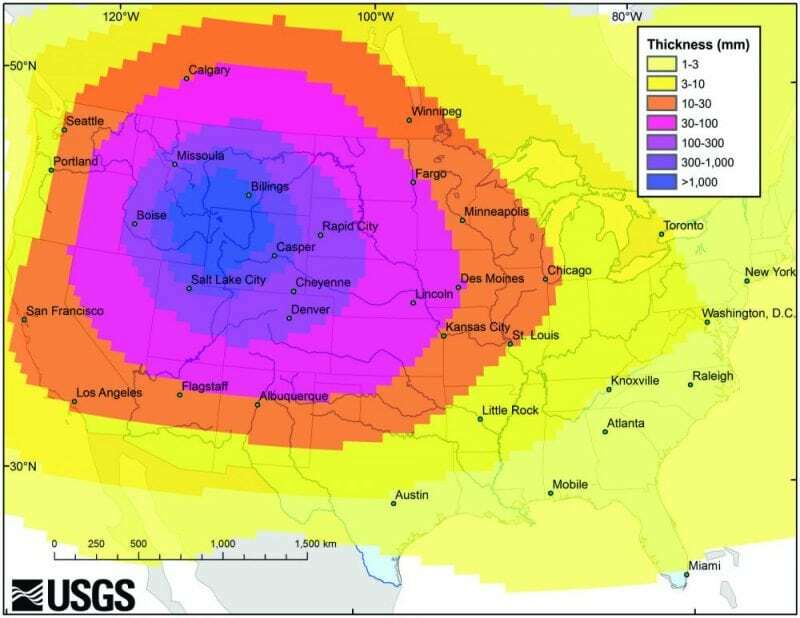 In a 2014 report in the journal Geochemistry, Geophysics, Geosystems, scientists reported that those regions within a 500-mile diameter circle of Yellowstone would see around 4 inches of ashfall. Areas outside of that region would also get ashfall and it could extend all the way to the coasts of the United States. These ash would be devastating to the environment and our food supply. Additionally, huge amounts of gases would be stuck in the atmosphere and absorb or reflect sunlight. This would cause climate cooling lasting over decades. This would disrupt food supplies, cause famines, and weather patterns. While it would not lead to an extinction level event, it would deeply affect the stability of the United States as a country and a region of natural resources. At the IAVCEI meeting, scientists unveiled that Yellowstone supervolcano would take about 10 years to get ready for an eruption. Given the frequency of past eruptions, it is not inconceivable that another is coming relatively soon. Hannah Shamloo and her team examined the last eruption that occurred. They looked at how the magma chamber changed over time through solidified crystals, formed in the magma chamber, and found that there were indications of triggering events and how long that took. They determined the answer was 10 years. This is a great improvement from previous estimates of up to 10,000 years. However, this would give much less time for governments and emergency agencies to prep for the eruption. However, knowing the timing more precisely could save a lot of lives, both human and animal, and resources, to prevent famines and lessen the impact of crop failure. There is additional research going on as to how we can stop or slow down the eruption. 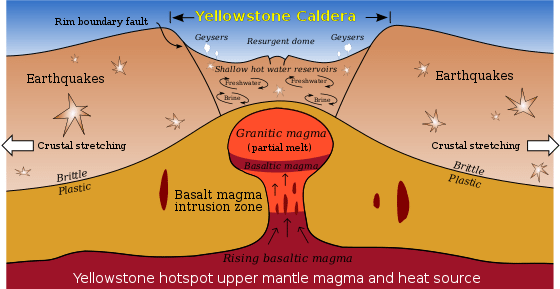 NASA is planning to drill into Yellowstone in order to get near the magma chamber and not in it because that might trigger an eruption. The hope is that the hydrothermal fluids would get near the magma chamber and cool it down, by stealing the heat. More research like these to prevent it and prepare for the eruption gives us a good chance of minimizing the damage done by Yellowstone, when it eventually erupts and can be used for other volcanoes around the world.